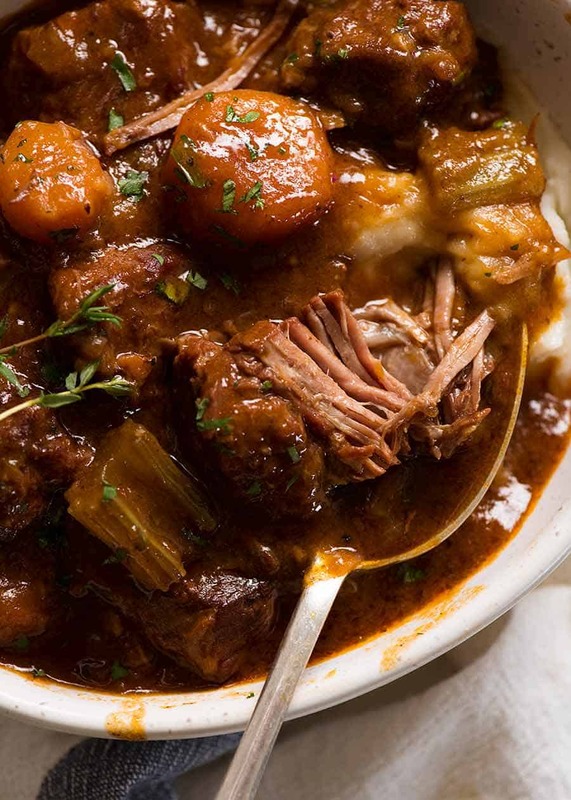 There’s no greater comfort food than a hearty stew. 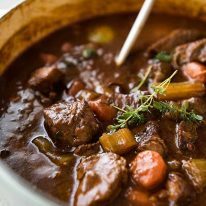 And Irish Beef and Guinness Stew might be the king of them all! 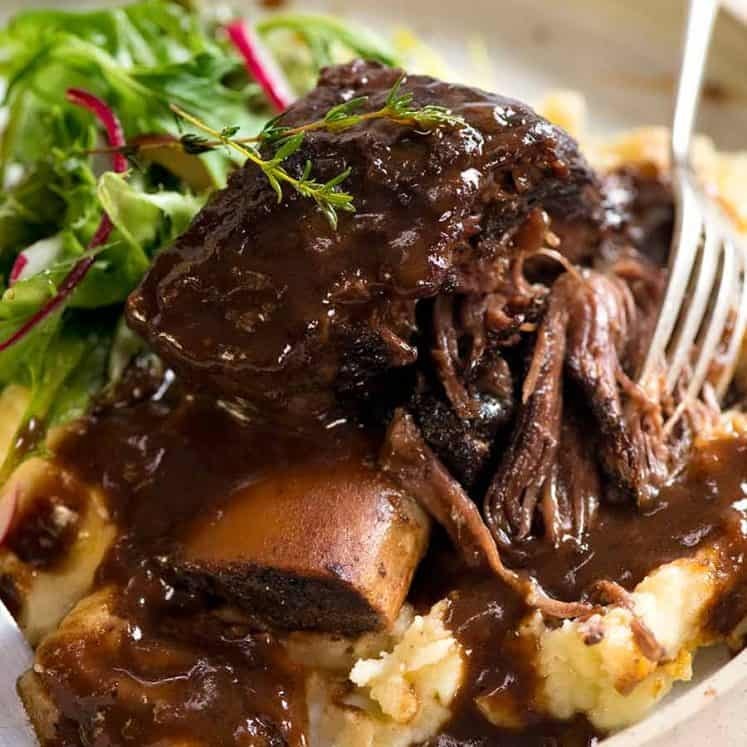 Guinness Beer gives the sauce an incredible rich, deep flavour, and the beef is fall-apart tender. While it takes time to slow cook, this is very straight forward to make. Stove, oven, in your slow cooker or pressure cooker – directions provided for all. Mop your bowl clean with Irish Soda Bread! Today I’m sharing one of the most epic stews in this world – Irish Beef and Guinness Stew. You know that anything simmered for hours is going to be a good thing. But this…. this is the stew of your dreams. The best of the best, this is the stew I make for company when I want to impress! With it’s deeply flavoured rich sauce, Guinness Beef Stew is THE stew you make when you want to impress! What kind of beer goes in Guinness Stew? The not-so-secret ingredient that goes into Guinness Stew that gives the sauce the deep flavour and colour is Guinness Beer. Guinness Beer is so dark it is almost black and it’s why the gravy of the stew is such a beautiful deep brown colour. Guinness is also much richer than most beers, which you can see just by looking at the thick creamy head (the foam) that Guinness is famed for. It’s pretty widely available these days – here in Australia, you’ll find it at most liquor stores. 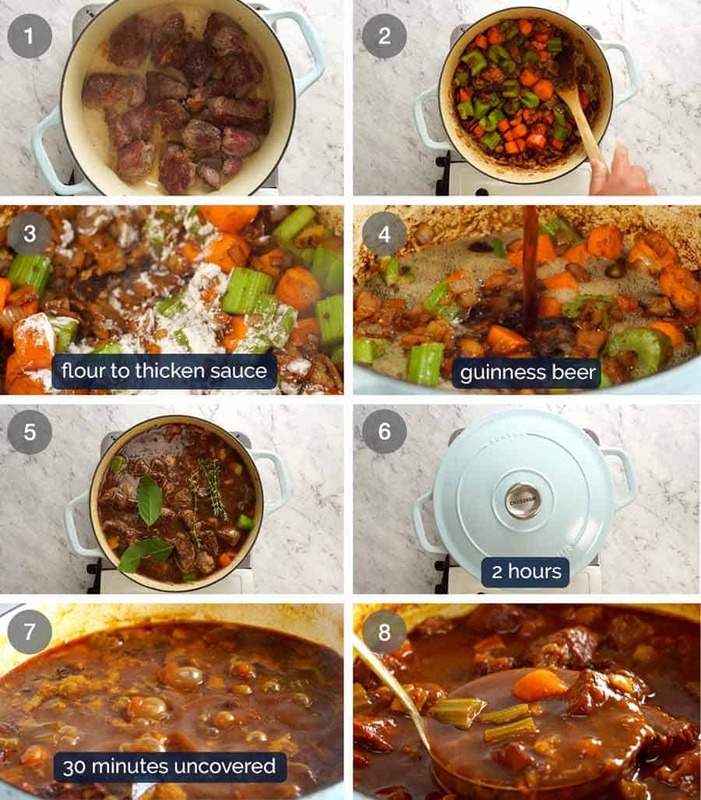 Traditionally, Guinness Stew is made with lamb. But in many parts of the world including here in Australia and North America, Guinness Stew is more commonly made with beef. I hope the Irish aren’t offended! 🙂 I’ve made it with lamb and to be honest, I do prefer it with beef. Tip: Use big chunky hunks of beef. Don’t even think about using tiny cubes of beef. It needs to be chunky pieces so it can be cooked for a looooong time to get all that flavour into the sauce! 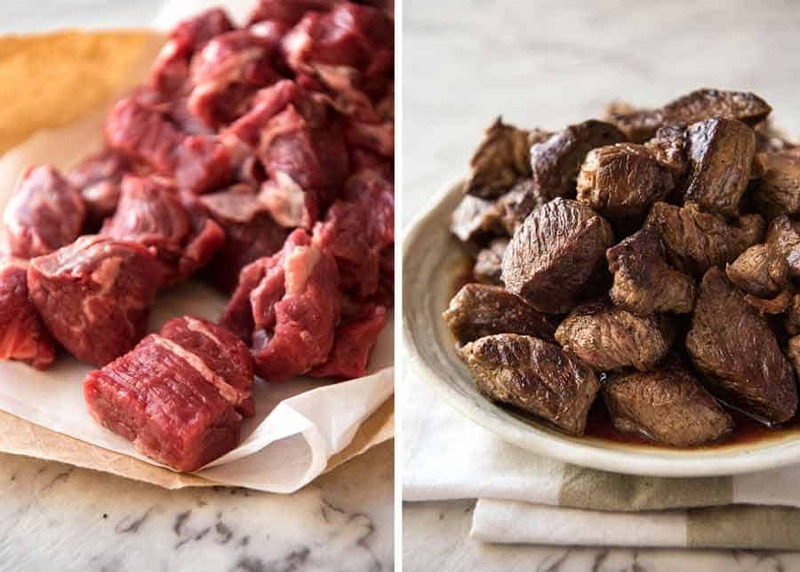 If the pieces of beef are too small, they will cook too quickly and fall apart in the stew before it’s had enough time to develop the deep flavours. 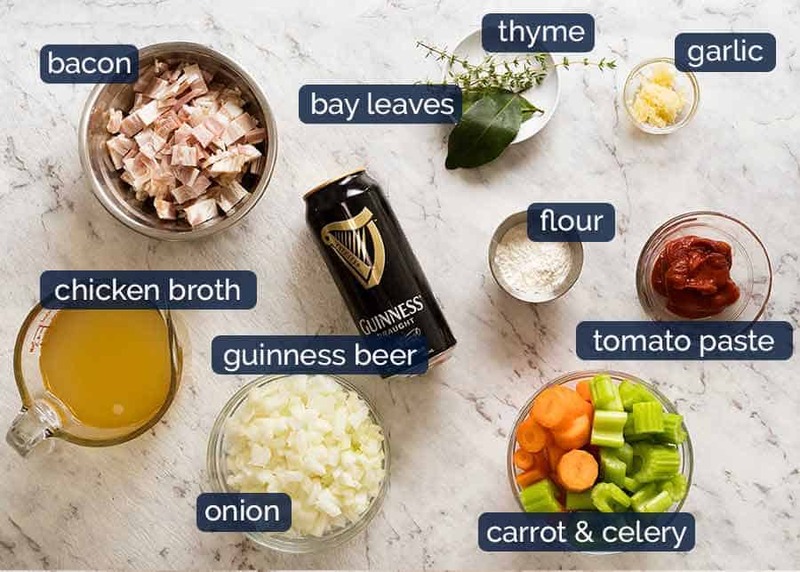 In addition to beef and Guinness Beer, here are the other ingredients in Irish Stew. Guinness Beer and broth/liquid stock – the braising liquids. I prefer using chicken rather than beef broth because it allows the flavour from the Guinness beer to come through better. Don’t worry, it doesn’t taste like beer at all, it transforms into a deep savoury sauce! Also, all the alcohol is cooked out. Thyme and bay leaves – to add a hint of flavour the sauce. 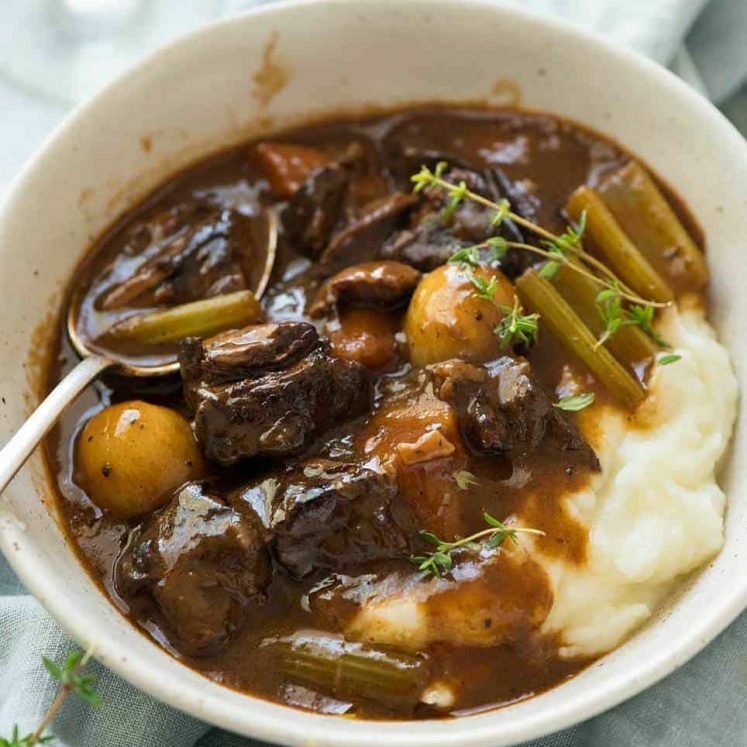 Though this Irish Beef and Guinness Stew takes time to cook, it is very straightforward. Once the lid goes on you just leave it for hours to simmer away gently. Totally hands off time! Simmer covered for 2 hours until the beef is pretty tender, then simmer for a further 30 minutes uncovered to let the sauce reduce a bit and for the beef to become “fall apart tender”. Yes it takes hours but your patience is rewarded with beef so tender you can eat it with a spoon! 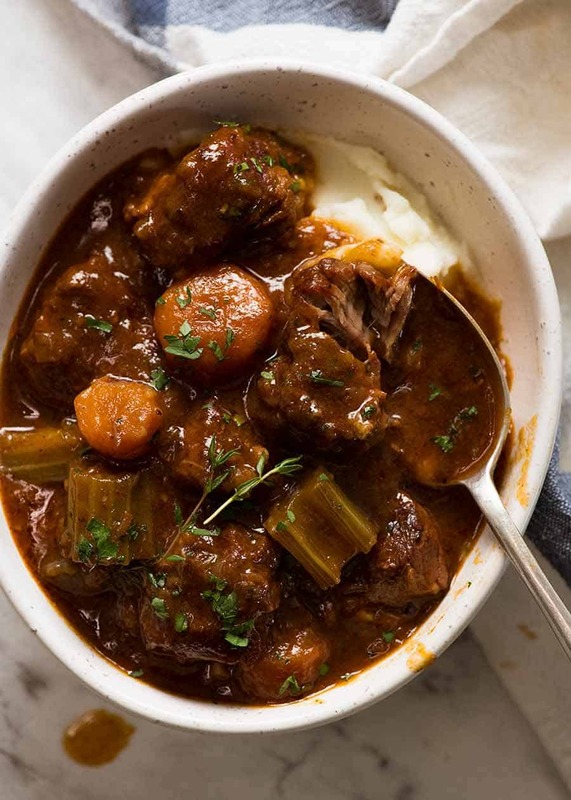 The one thing I do differently to most Guinness Beef Stew recipes, including very traditional Irish recipes, is to thicken the sauce slightly with flour. If you don’t do this step, the sauce is quite thin and watery, and while the flavour is still lovely, I really prefer the sauce to be more like a thin gravy. 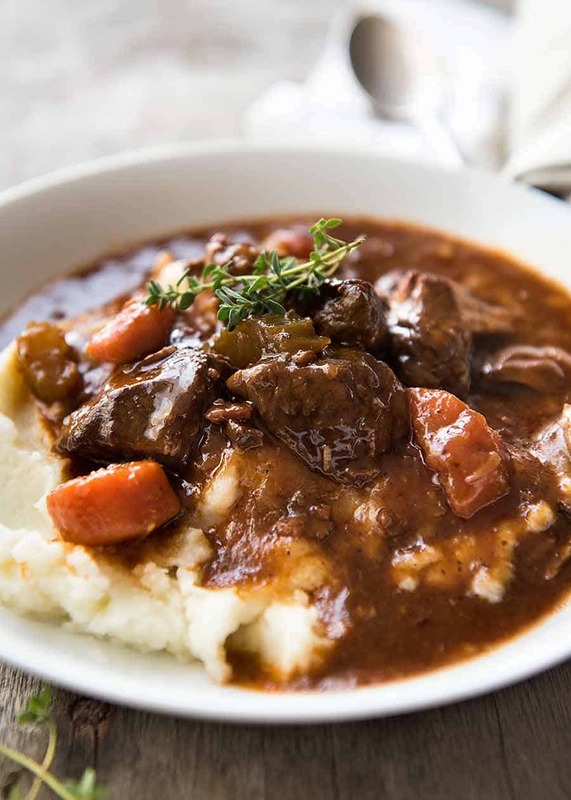 Serve Beef and Guinness Stew over mashed potato or cauliflower mash for a low carb option. And what about some warm crusty Irish Soda Bread to mop your bowl clean?? 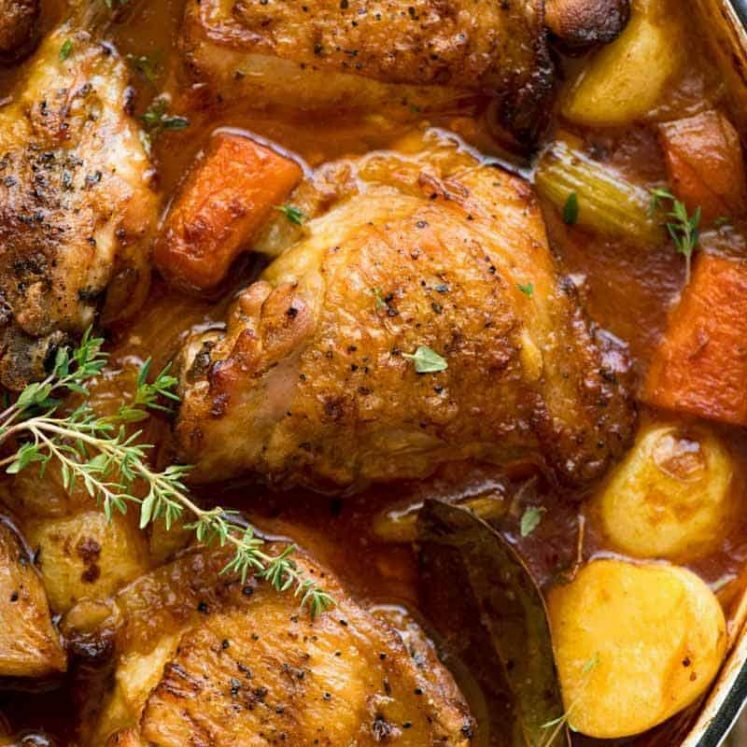 Browse Winter Warmer recipes and see more Stews! RECIPE VIDEO ABOVE. The great Irish Beef and Guinness Stew is easy to make but requires patience while it slow cooks! The Guinness Beer is the secret weapon ingredient in this, creating a sauce that has wonderful deep complex flavours. Cut the beef into 5cm/2" chunks. Pat dry then sprinkle with salt and pepper. Lower heat to medium. If the pot is looking dry, add oil. Cook garlic and onion for 3 minutes until softening, then add bacon. Cook until bacon is browned, then stir through carrot and celery. Add flour, and stir for 1 minute to cook off the flour. Add Guinness, chicken broth/stock and tomato paste. Mix well (to ensure flour dissolves well), add bay leaves and thyme. Return beef into the pot (including any juices). Liquid level should just cover - see video or photos. Cover, lower heat so it is bubbling gently. Cook for 2 hours - the beef should be pretty tender by now. Remove lid then simmer for a further 30 - 45 minutes or until the beef falls apart at a touch, the sauce has reduced and thickened slightly. Skim off fat on surface, if desired. Adjust salt and pepper to taste. Remove bay leaves and thyme. 1. 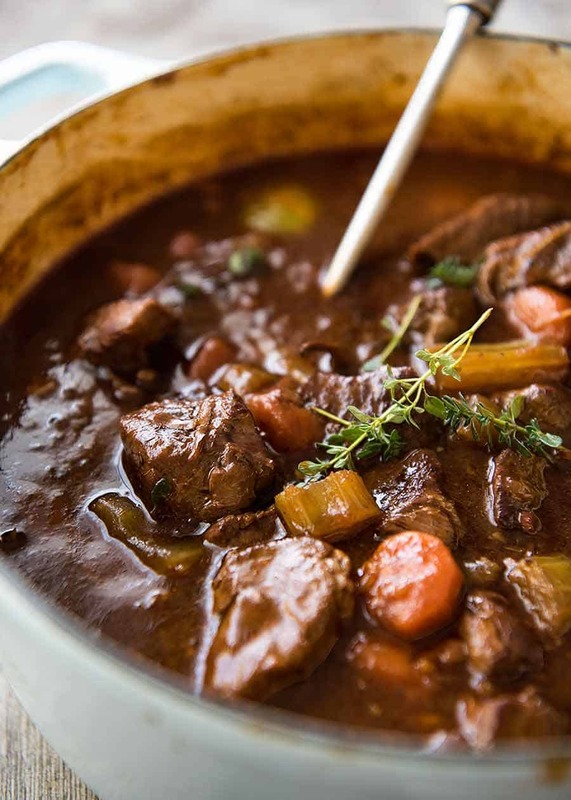 Guinness Beer is a dark coloured rich Irish beer and it is the key flavouring for the sauce of this stew. You CANNOT taste it in the finished dish, it just melds into an amazing sauce. In Australia you can get Guinness at all major liquor stores. There is no non alcoholic substitute unfortunately. 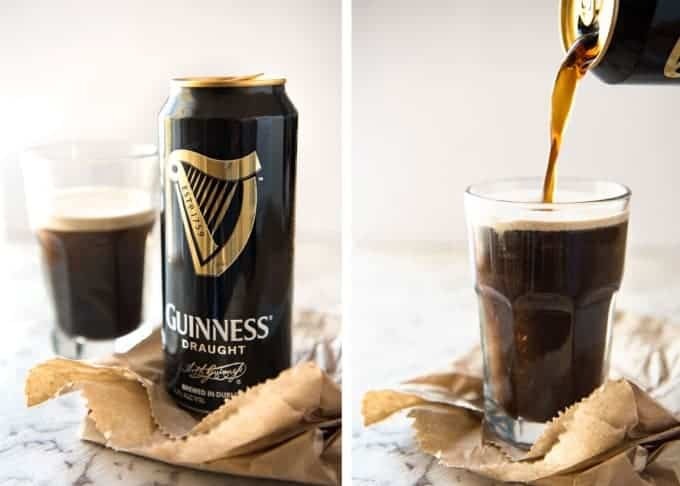 If you cannot consume alcohol, substitute the Guinness with 2 cups water + 1 tbsp Worcestershire sauce + 2 beef bouillon cubes crumbled. This will make it a classic beef stew. Taste FAB, it just isn't Irish Guinness Stew! - OVEN: Cover and bake for 2 1/2 hours at 160C / 320F. Remove then cook for a further 30 - 45 minutes to reduce sauce, per recipe. - SLOW COOKER: Reduce chicken broth by 1 cup. After you add the Guinness and broth/stock into the pot, bring to simmer and ensure you scrape the bottom of the pot well. Transfer everything into slow cooker. Add remaining ingredients per recipe. Cook on low for 8 hours. If sauce needs more thickening, simmer with slow cooker lid off (if you have that function), to ladle some of the sauce into a separate saucepan and reduce on stove. 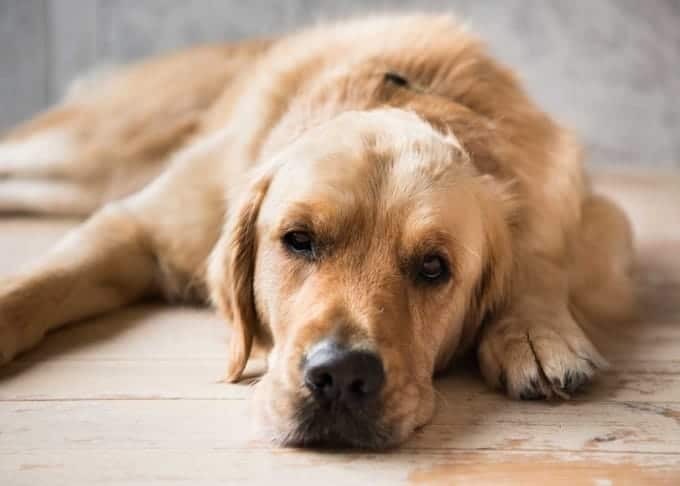 - PRESSURE COOKER: Follow slow cooker instructions, cook on HIGH for 40 minutes (this might seem longer than most but we're using chuck here which needs to be cooked for a long time until tender and also the pieces are large). 3. FLOUR: I prefer my stew sauce a bit thick, not watery, so I always add flour to slightly thicken the sauce. Some recipes say to dust beef with flour before browning - I prefer not to use this method because the flour burns then this permeates throughout the whole stew. GLUTEN FREE OPTION - skip the flour in the recipe. Cook per recipe then right at the end, when the beef is tender and the liquid has reduced down, mix together 2 1/2 tbsp of cornflour/cornstarch with a splash of water. Add to stew, and watch as it thickens! 4. Beef vs Chicken Broth - I use chicken broth because the flavour is slightly more mild which lets the guinness flavour come through more. But beef broth works just as well and you can definitely still taste the Guinness!! 5. Nutrition per serving, excluding mashed potato. This nutrition is overstated because it does not take into account the fat that is skimmed off the surface. Originally published July 2016, updated with new video and step photos in March 2019. No change to recipe. Today I am making this recipe for the second time in 3 weeks. That in itself says how much e liked this stew. I read most of the comments before the first attempt and fried the bacon on its own, removed to d dish and then continued with the onions and garlic, etc. I made it in a crock pot, reduced the broth to 2 cups, as suggested. From the time I started cutting the ingredients to the time everything went into the crock pot was a little over an hour. I cooked it on high for the firsts 2 hours and then on low for 4 hours. The first time I used a 4 quart pot and it was filled almost to the rim. Today I am using my 6 quart pot (I had a little bigger piece of meat). This is a very good recipe. I had shared with our neighbour and then she asked for the recipe. I’m so glad you love it Rosanna! !